Not all fat is bad for you. In fact, some fats are crucial for good health. While it's important to limit your fat intake to 20 to 35 percent of your calories, it's also important to ensure that within this range you're mostly eating a variety and balance of "good" fats and not "bad" fats. Avocado as an ingredient in guacamole is a source of “good” fat, but the additional ingredients in the guacamole may not be so good. Tortilla chips, that often accompany the guacamole, can be loaded with undesirable fat. Learn to discern good fat from bad fat and better choices may become a habit. Good fats come in two forms: Polyunsaturated and monounsaturated. Omega-6 polyunsaturated fats can help to lower blood cholesterol. Omega-3 polyunsaturated fats can also lower blood-cholesterol when used in place of saturated fats. 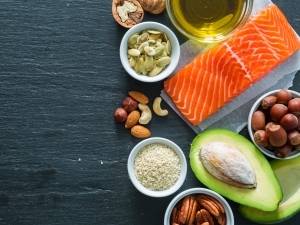 Omega-3 fats have many other health benefits, such as lowering blood triglycerides and blood pressure levels, as well as reducing the risk of heart disease. They may also protect against some cancers. Rich sources of Omega-6 include safflower, sunflower and corn oils. Sources of Omega-3 include canola, flaxseed, walnut, and soybean oils, and oily fish like mackerel, herring, tuna, and salmon. (Note: Sources of omega-6 – safflower, sunflower, and corn oils – are overabundant in the typical diet. Aim for a 1:1 ratio of omega-6 to omega-3 fats in your diet). These fats can help to lower "bad" LDL-cholesterol and maintain the protective "good" HDL-cholesterol in the bloodstream - but only if they replace saturated fats in the diet. Foods rich in monounsaturated fat include olive and canola oils, peanuts, and avocados.